Kejriwal urged "police to stop playing politics. Rather than giving security to me, let them deploy these men for aam aadmi's security." 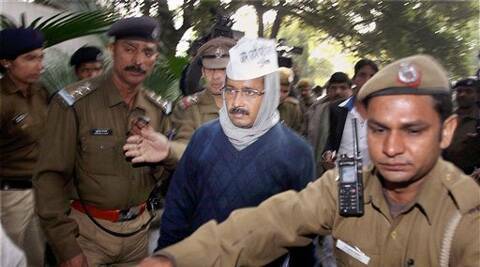 Terror outfit Indian Mujahideen has plans to abduct Arvind Kejriwal for release of its key member Yaseen Bhatkal, police said but the Chief Minister on Sunday doubted the police version and refused to take security. A team from the security wing of Delhi Police has briefed Kejriwal about intelligent inputs about the terror outfit’s plan and requested him to take ‘Z’ category security cover but Kejriwal declined to oblige, the top sources said. Senior Police officials said that they have received an input in this regard from intelligence agencies and conveyed it to Kejriwal. “I am not afraid of my life. As I said, I strongly believe in God. Will not take any security,” Kejriwal said. In a series of tweets, the Chief Minister accused the police of leaking out the information and questioned “is Delhi police and central govt playing politics with my security”. “Police officials met me in afternoon. Informed me abt threat. Asked me not to disclose it to media. Den dey themselves went and told media. By announcing this, haven’t police made me vulnerable. Now anyone can attack and it wud be said that Bhatkal’s men did it,” he said in his tweets. “Is Delhi police so foolish or r they playing politics? At whose instance?,” he said. Kejriwal has been declining to take security cover keeping up with his Aam Aadmi Party’s policy to end VIP culture in politics. Bhatkal was arrested from Indo-Nepal border on August 27 last year. Bhatkal, who hails from Bhatkal village in Udupi district of north Karnataka, was allegedly involved in a string of terror attacks in Ahmedabad, Surat, Bangalore, Pune, Delhi and Hyderabad, the NIA had said. He was earlier associated with the banned Students Islamic Movement of India (SIMI) and is alleged to have hatched a conspiracy with others to wage a war against India.